Located in the City center of downtown Cairo and Near to train station and Near to the residential and diplomatic sector of Cairo on Giza , Mohandesseen ,the Pharaoh Egypt Hotel is only 17 km from Cairo International Airport and Distance to railway station. Whether you come for shopping , sightseeing ,entertainment the area surrounding the hotel offers it all. 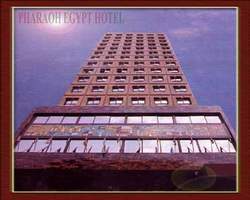 The Pharaoh Egypt hotel offers 140 guest rooms including 22 connecting rooms. Bathrooms with bath tube or shower, Direct dial phone, Balcony, 24 hour room service, Radio, Safe, Air-conditioning, Cable and satellite TV, Video and Movie channels. Unas Restaurant serves an "A La Carte" menu, oriental food, Pool Side Cafe at 13th floor on the rooftop while overlooking the Nile for light meals and snacks with light music and parties. The Pharaoh Egypt Hotel provides (M.F.U) multi-functional air conditioned banquet rooms with up to120 seats, as well as conference meeting rooms & convention rooms. The Pharaoh Egypt Hotel provides 24 hour room service, laundry, dry-cleaning service, health club (gym-sauna-steam baths-massage), beauty saloon, parking, restaurant and concierge service. Express checkout, 24-hour front desk, 24-hour money exchange, Travel Agency (on request), Car rental available. In-room refrigerator, Coffee can be had 24 hours a day in the Pharaoh Egypt Coffee Shop. Meet and greet services at airport (on request). Airport pickup and drop-off arranged on request. Shopping, arcade, No-smoking rooms, bazaar you can meet any of your daily needs or buy souvenirs and perfumes. Bookshop and gift shop, hairdresser, a swimming pool on the roof with a view of the pyramids in the horizon .